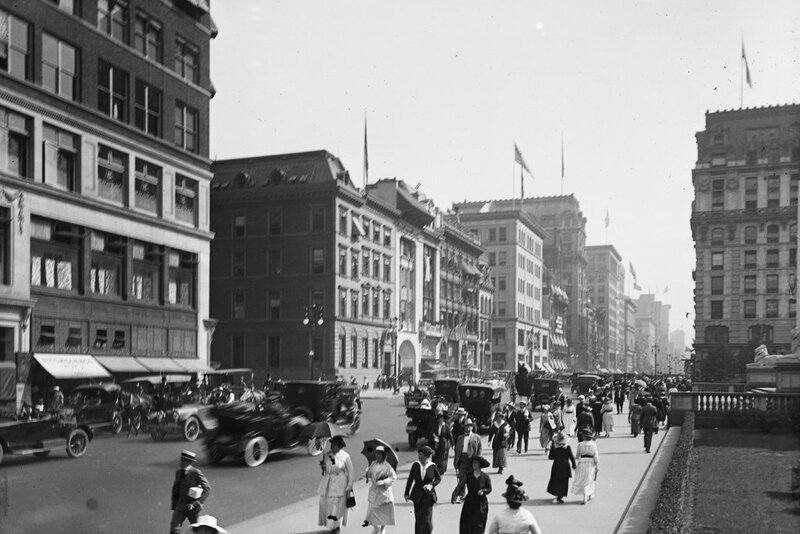 Looking south on Fifth Avenue in New York City from in front of the New York Public Library, between 41st and 42nd Streets, around 1910-1915. Image courtesy of the Library of Congress, Detroi Publishing Company Collection. The first photo is blurry and somewhat out of focus, which gives a busy, chaotic feel to the picture as blurred cars speed past the pedestrians on the crowded sidewalks. Not much has changed in that regard in the past century, and even many of the buildings from the first photo are still standing. There is a good number of modern skyscrapers in this scene, but interspersed with them is a variety of early 20th century commercial buildings. Some of the historic buildings in the present-day scene include the Knox Hat Building on the far right, at the corner of 42nd Street. Built in 1902, this 10-story building housed a company that probably sold many of the hats worn by the pedestrians in the first photo. 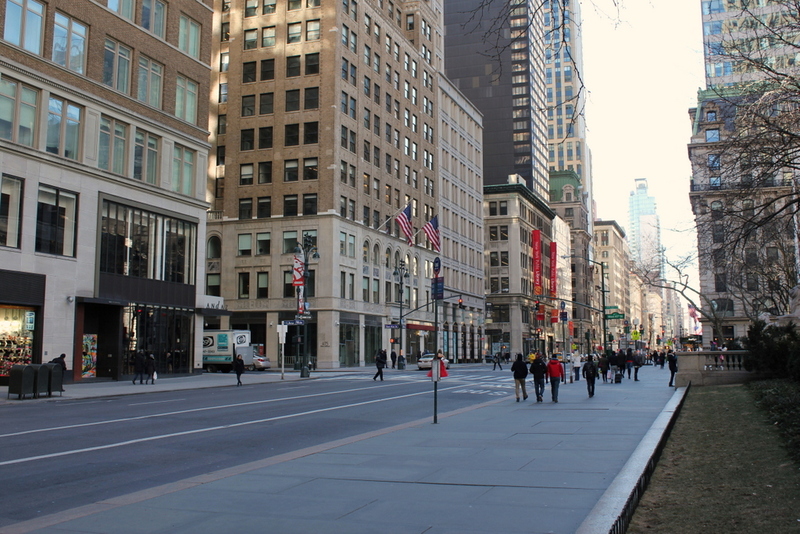 Further down Fifth Avenue on the left is a similarly-designed building with a copper mansard roof. This was the Knabe Building, which was completed in 1906 for Wm. Knabe & Co., a piano manufacturing company. 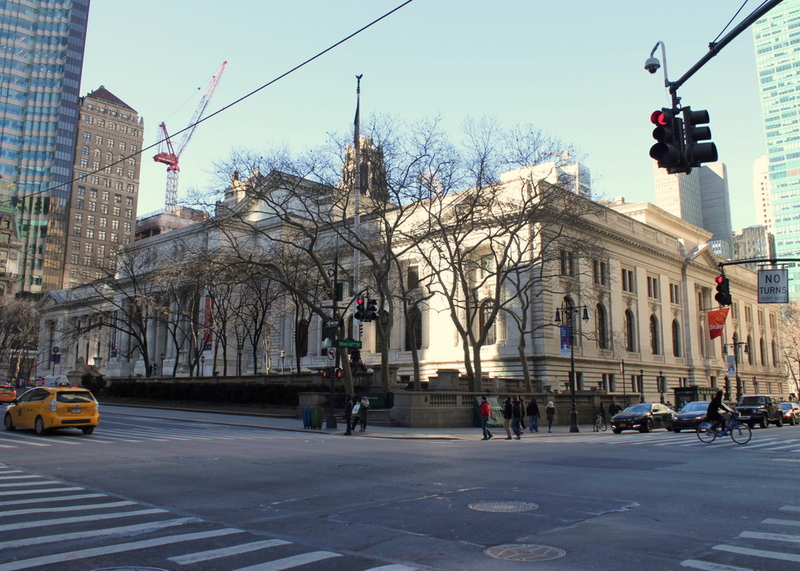 Other early 20th century commercial buildings include the one on the far left at the corner of 41st Street, and, a block away, the current Mid-Manhattan Library building, which has the two vertical red banners in the 2016 scene. 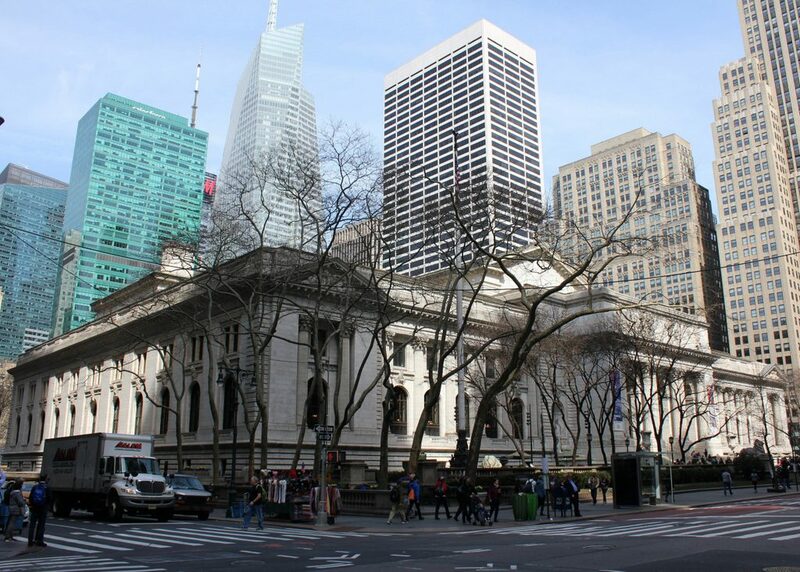 The most prominent building in this area, though, is the main branch of the New York Public Library just out of sight to the right. Only the lions at the front steps are visible from this angle, but they help to establish the date of the first photo as being no earlier than about 1910-1911, when they were installed at the newly-opened library building. 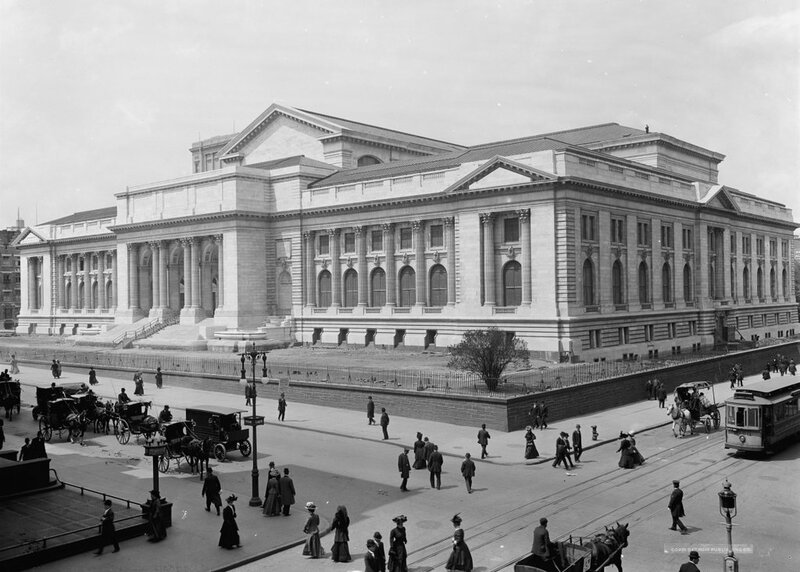 The New York Public Library, seen from the corner of Fifth Avenue and 42nd Street around 1908. Image courtesy of the Library of Congress, Detroit Publishing Company Collection. The first photo here was taken a few years before the one in this earlier post, and it shows the library shortly before its completion. At this point the building had been under construction for about six years, and although the exterior was mostly finished, there was still about three more years of work left to do. The grounds had not been landscaped yet, and instead the library was surrounded by dirt and debris, with a simple brick wall and metal picket fence around the construction site. Also missing from the first photo were the two lion statues that now flank the front steps. Originally nicknamed Leo Astor and Leo Lenox after two of the library’s greatest benefactors, they were designed by sculptor Edward Clark Potter and were installed by the time the library opened in 1911. 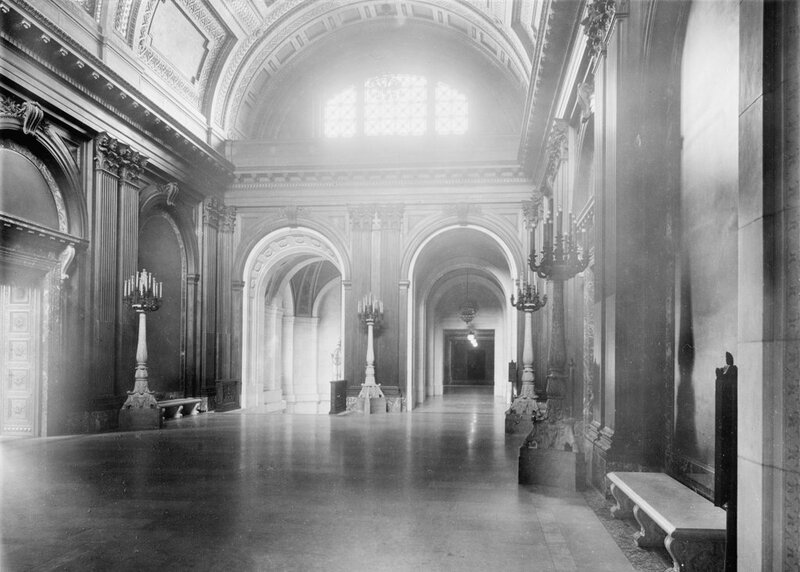 The McGraw Rotunda on the third floor of the New York Public Library Main Branch, around 1911-1920. Image courtesy of the Library of Congress, Detroit Publishing Company Collection. 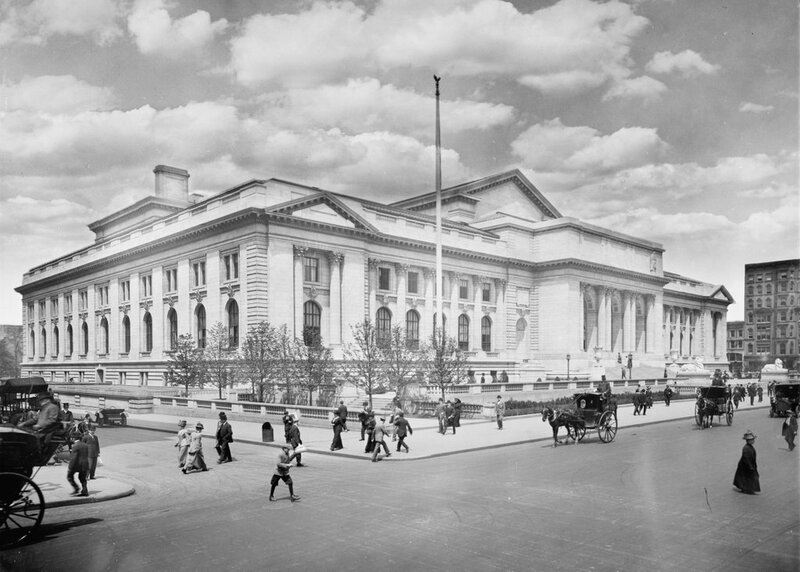 The main branch of the New York Public Library, located at the corner of Fifth Avenue and 42nd Street, was completed in 1911, and the first photo was probably taken soon after, as it is part of a series of photos that the Detroit Publishing Company took to show the interior of the new building. The rotunda includes walnut paneling and a valuted ceiling, and the present-day photo also shows the murals that were added after the first photo was taken. Located on the walls and on the ceiling, the murals are entitled “The Story of the Recorded Word,” and were painted in 1937 by Edward Laning. One of them depicts Johannes Gutenberg holding a page from his famous Bible, which was the first book to have been printed using movable type. 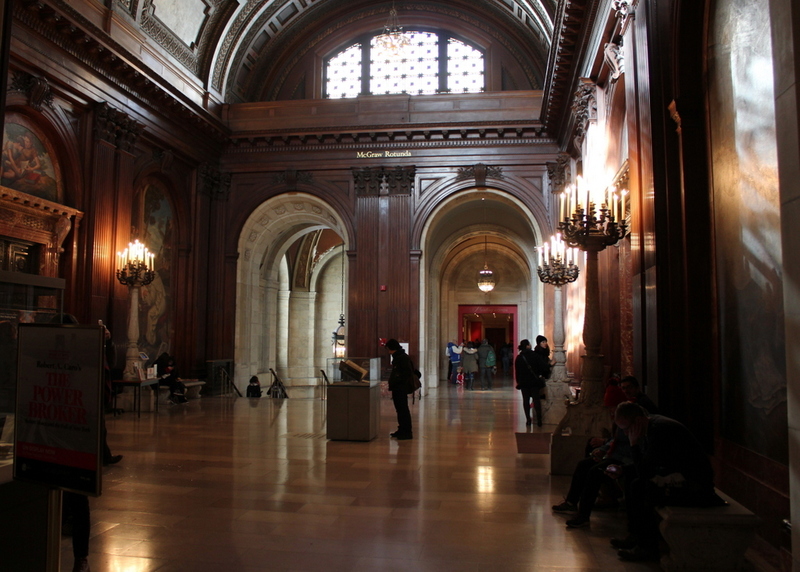 Appropriately, the McGraw Rotunda is also home to the New York Public Library’s copy of the Gutenberg Bible, which can be seen in the center of the 2016 photo. It was the first Gutenberg Bible in the United States, when James Lenox brought it here in 1847, and today it is one of only 49 existing copies in the world.